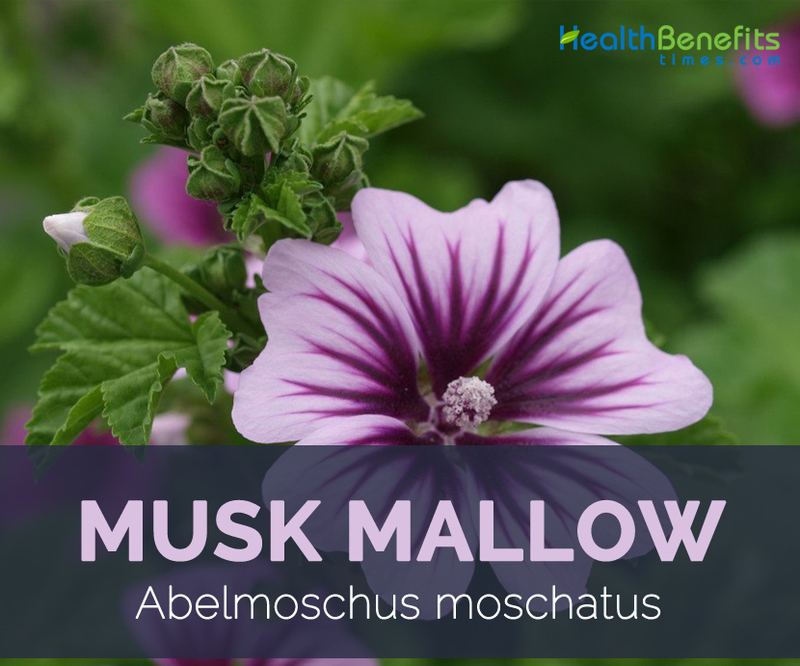 Musk mellow scientifically known as Abelmoschus moschatus is an aromatic and medicinal plant native to India in the Malvaceae family. Abelmoschus is derived from Arabic ‘Abu-l-Mosk’ (father of musk) and moschatus means musk smelling (in Latin). 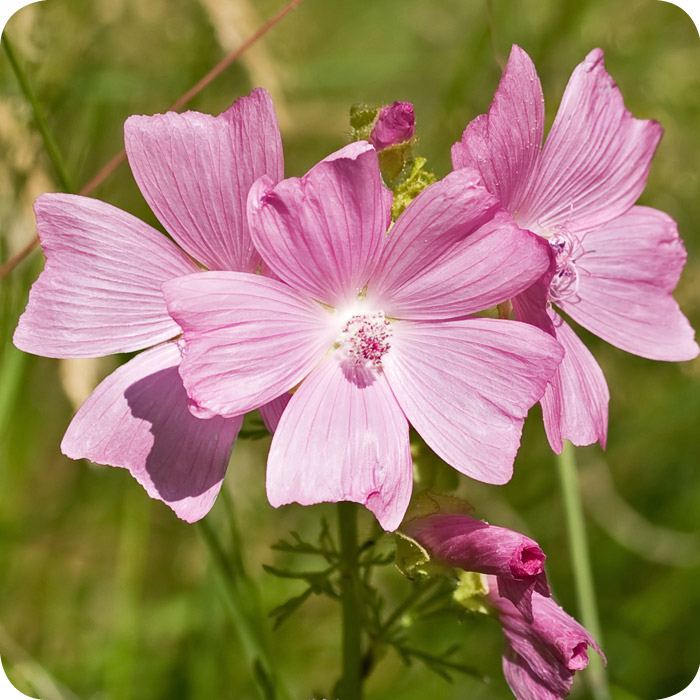 Musk mallow drives its name due to the musk like fragrance of its flower. 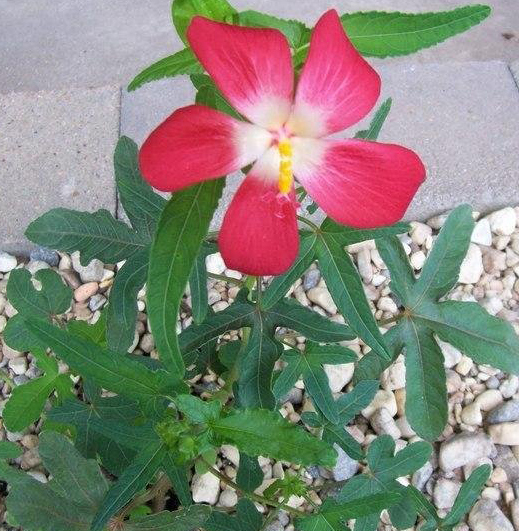 It is a non-toxic plant with edible leaves, flowers and seeds. The flowers and seeds can be eaten raw. Every part of this medicinal plant is used in one or the other way. 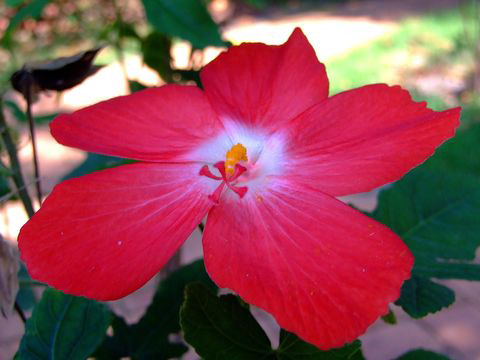 Apart from musk mellow it is also known as Ambrette seeds, Annual hibiscus, Musk mallow, Musk seeds and Ornamental okra. The seeds have a sweet, flowery, heavy fragrance similar to that of musk. Abelmoschus moschatus is a soft, herbaceous trailing plant, 0.5- 2.5 meters high with soft hairy stems and a long slender tap root. Leaves are polymorphous, ovate-cordate or more usually palmately cut into 3-5 acute lobes, dentate-serrate, hairy on both sides. Petiole is usually longer than leaves, with long deflexed hairs. Stipules are small and subulate. 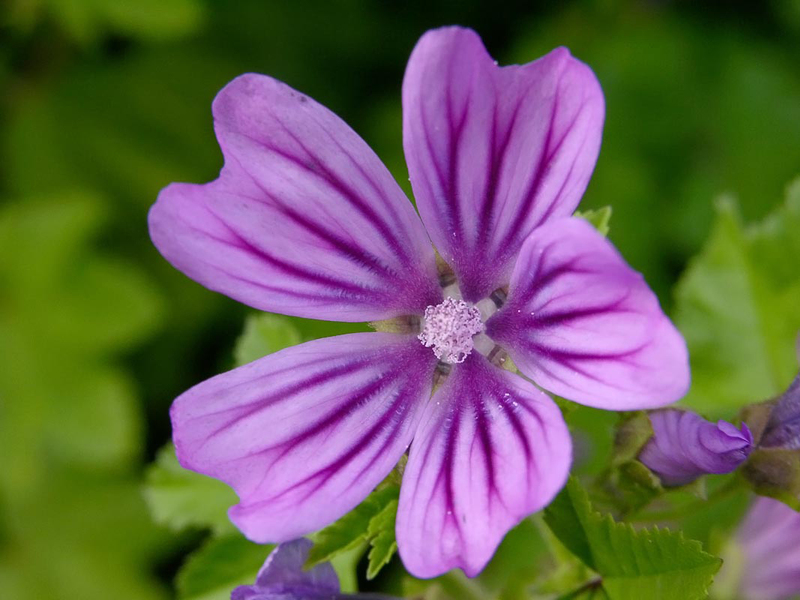 Flowers are solitary, axillary, large, 3-4 inch, bright yellow, with a purple center. Pedicels are stout, curved, much thickened beneath the flower. Epicalyx segments are 6 – 10, fulvous-hairy. Calyx is spathaceous, deciduous. Corolla is yellow with purple center. Stamens are monadelphous. The flowers are hermaphrodite (have both male and female organs) and are pollinated by Insects. Fruit is long, lanceolate in form of capsule with numerous greyish-brown-blackish seeds, kidney-shaped, slightly compressed with shallow depressions on both sides. They are not velvety to touch. They smell musk-like but with no taste. The fiber content in seedpods and mucilage substance in Abelmoschus Moschatus helps reducing habit of constipation. It lubricates the gut and eases in passing stools. Ambrette is beneficial in constipation with dry and hard stools. Ambrette seeds are used for their diuretic action in urinary diseases. Seeds also have anti-inflammatory and antimicrobial properties due to which they help in reducing inflammation and infection of urinary tract and urinary bladder. 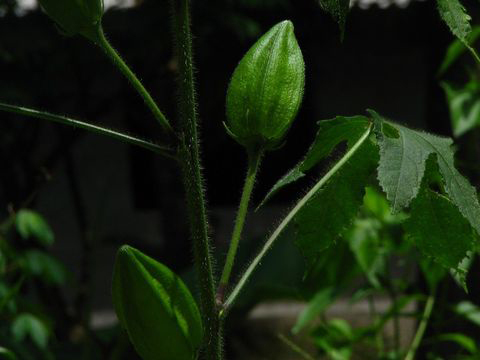 Indian folks use Musk mallow (Kastori Bhindi) in diabetes. Ambrette seeds are more beneficial for stabilizing sugar level in the blood. It cleanses urinary bladder, acts as aphrodisiac and is useful in eye disorders. Roots and leaves help to cure gonorrhea. Seeds are also chewed as a nervine, stomachic and to sweeten the breath. Seeds are valued medicinally for their diuretic, demulcent and stomachic properties. They are also said to be stimulant, antiseptic, cooling, tonic, carminative and aphrodisiac. Paste of the bark is applied to cuts, wounds and sprains. Essential oil is used in aromatherapy for the treatment of depression and anxiety. It is also applied externally to treat cramp, poor circulation and aching joints. Decoction of seeds is given internally for disorders of the spleen, vomiting and pectoral lesions. Musk Seed Oil is used in aromatherapy for anxiety, depression, nervousness and stress. Leaves and roots are used for headaches, rheumatism, varicose veins, fever and gonorrhea. Plant is considered a heart tonic and an excellent snakebite remedy. Muskdana seeds are added to coffee for flavoring. Its leaves are used as vegetable. Young leaves and shoots are cooked in soups. Leaves are also used to clarify sugar. Seed is fried or roasted and has a flavor similar to sesame seeds. Seed is also used as a flavoring for liqueurs or to scent coffee. An essential oil is obtained from the plant and is used to flavor baked goods, ice cream, sweets and soft drinks. Ambrette oil is extracted from seed, is used in perfume industry. It is used as a food flavoring and in perfumery as a musk substitute. Seeds are used as an insecticide. Mucilage obtained from the roots is used as a size for paper. Tobacco is flavored with the flowers. Harvested seeds are sun dried and use in perfumery industries. Fiber obtained from the stems is used for cordage, textiles and paper making. Bark yields a fiber that is used to produce tough cloths. Cramps, intestinal disorders, loss of appetite: The tea or tincture prepared from the seeds is taken orally to heal cramping. Excess phlegm: Fruits are eaten to reduce the phlegm. General tonic: The juice obtained from the fruits is used as general tonic. Gonorrhea: The mucilage prepared from the roots and leaves is given orally. Itch: The seeds are rubbed to a paste with milk, and applied. Nervous debility, spermatorrhoea (Dhatu Roga), urinary disorders, Prameha, flatulence: Soak the chopped fruits in water at night and drink the water and chew the pieces next morning. Oral problems: Prepare decoction of seeds/leaves and use as gargle. Sweeten the breath: Chew the seeds. Urinary problems: Seed powder dissolved in water is given with Honey at night after meal. Worms, gastro-intestinal disorders: Extract of seeds in given. 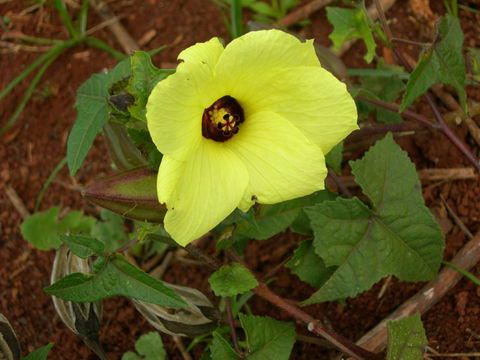 Abelmoschus moschatus also known as Ambrette seeds, Annual hibiscus, Musk mallow, Musk seeds, Ornamental okra is an aromatic and medicinal plant native to India. 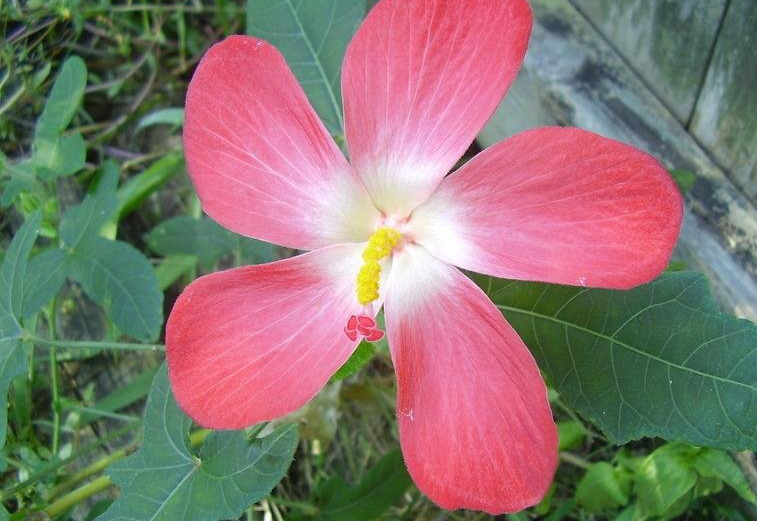 The ambrette seeds have a sweet, flowery, heavy fragrance similar to that of musk. Abelmoschus manihot is used to make neri, a starchy substance used in making Washi. 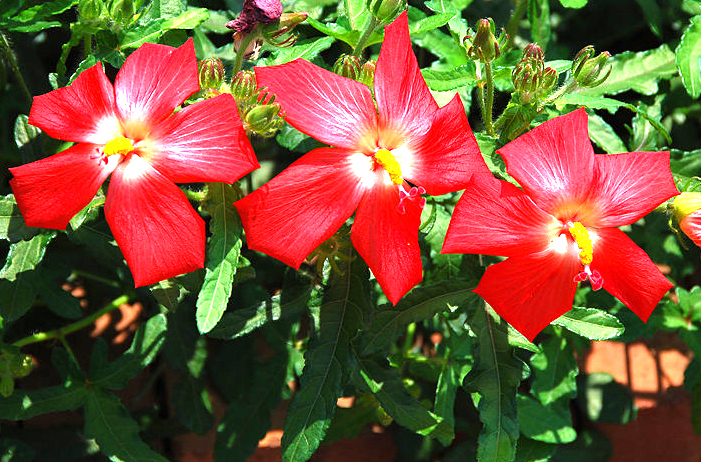 It is a non-toxic plant with edible leaves, flowers and seeds. The flowers and seeds can be eaten raw. Every part of this medicinal plant is used in one or the other way. 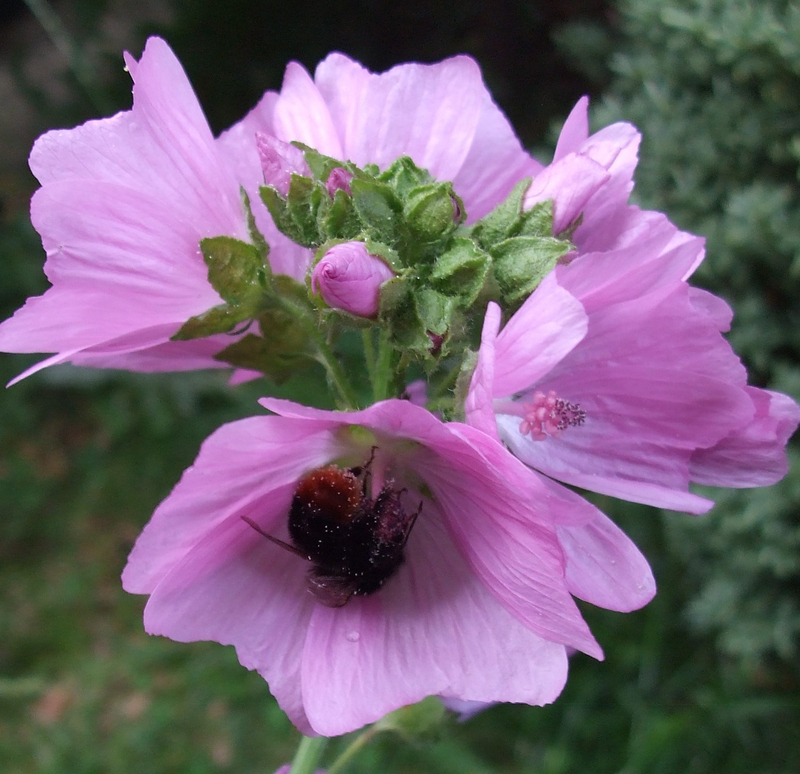 Musk mallow drives its name due to the musk like fragrance of its flower. Italian: Ambretta, Abelmosco, Fior muschiato, Ibisco muschiato. Tamil: Vettilaikkasturi, Kattuk-Kasturi, Kasturivendai, Kattukkasturi, Veṟṟilaikkastūri. Bengali: Kasture, Kala-Kasturi, Latakasturi, Mushakdana. Russian: Абельмош мускатный Abelʹmosh muskatnyj, Гибискус мускусный Gibiskus muskusnyj, Желтый гибискус Zheltyĭ gibiskus. Vietnamese: Cây bông vàng, Bụp vang, Bụp vàng, Búp vàng, Vông vang, Vông vàng. Root Long slender tap root. Leaf Polymorphous, ovate-cordate or more usually palmately cut into 3-5 acute lobes, dentate-serrate, hairy on both sides. Petiole is usually longer than leaves, with long deflexed hairs. Stipules are small and subulate. Flower Solitary, axillary, large, 3-4 inch, bright yellow, with a purple center. Pedicels are stout, curved, much thickened beneath the flower. Seed Greyish-brown-blackish, kidney-shaped, slightly compressed with shallow depressions on both sides. They are not velvety to touch. Seeds are used both internally and externally for snake bite. It can be used to improve the taste of the mouth by healing damaged taste buds. Regular ingestion of this fruit helps to tone up the cardiac muscles. 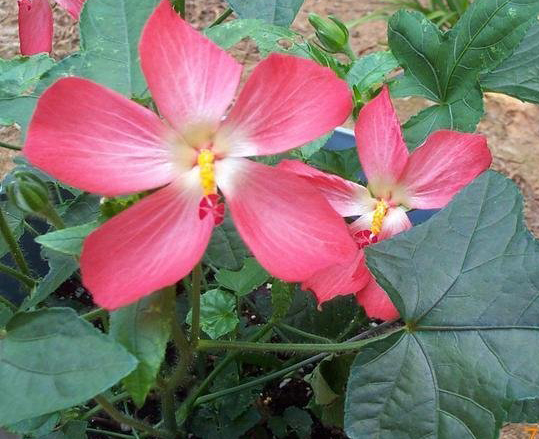 Musk mallow is also used in improving erectile dysfunction and also increases the sperm count. 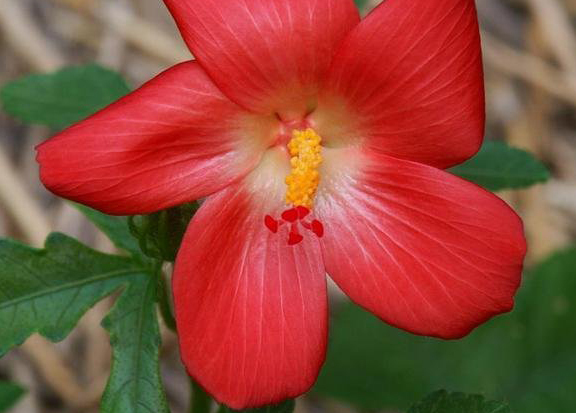 Musk mallow leaves are used to cure insect bites. Yellow portion of the petals is used in myricetin, flavonoids and cannabiscitrin. The infusion, decoction or tincture of the seeds is used in cases of nervous debility, nervous disorders, and hysteria. Excess dose may cause giddiness, headache etc. The seeds are cooling. Excess use may cause low appetite and indigestion. It is not recommended in pregnant or breastfeeding women due to a lack of available scientific evidence. Abelmoschus abelmoschus (L.) H. Karst. 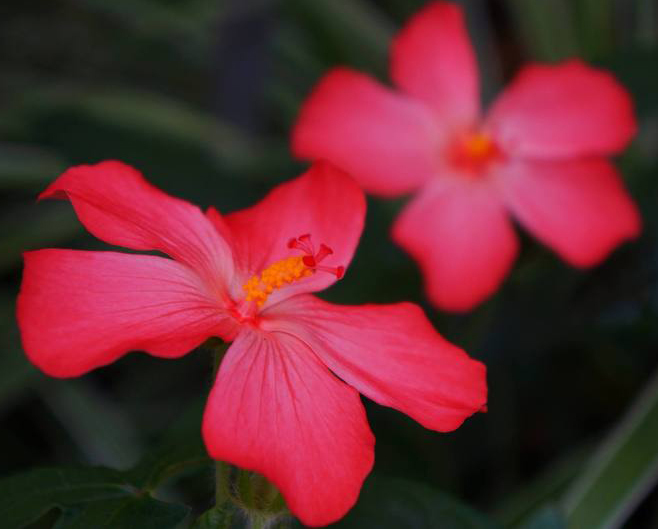 Hibiscus abelmoschus (L.) H. Karst.